Beginning January 1, 2007, this page will include links to stories from the news on Persepolis, but not related to the Persepolis Fortification Archive. News stories on the archive will be in Persepolis Tablets in the News. “There’s like 20 RCMP officers flooding my place, the sunshine’s coming in, the crystals are making rainbows everywhere, the bougainvillea flowers are glowing in the sunrise light,” Simon Metke, Edmonton yoga instructor, interviewed after Royal Canadian Mounted Police seized a Persepolis fragment from his meditation room. “We are simply flabbergasted at what has occurred,” statement by Rupert Wace, UK art dealer. The museum chose to keep the insurance money, so the museum’s insurance company sold it to a London art dealer for over a million dollars. It should have had a quiet life from then on, perhaps in a private collection, then probably in another museum. The dealer exhibited, published, and promoted the object in England. Then in 2017, the dealer made an unfortunate choice; he brought it to one of the world’s great art fairs, The European Fine Art Fair, located in New York City’ Armory. The oldest bull in Chicago came from a Persian palace. Chris DeRose takes us to the Oriental Institute to find out more. LONDON, (CAIS) -- Iranian Archaeologists have begun work on unearthing the Persepolis swage system, which in ancient times diverted rainwater from the platform to prevent flooding, reported the Persian service of ISNA on Tuesday. A team of Iranian archaeologists has recently discovered 20 meters of a canal of the sewage system of Persepolis in southern Iran. 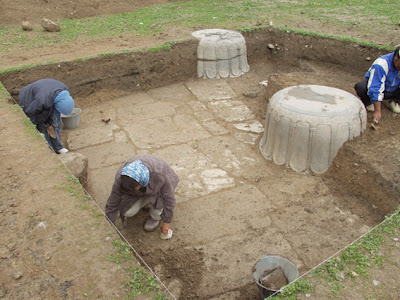 The team led by Ali Asadi has been commissioned to carry out excavations of the sewage system to discover how the system worked during the Achaemenid era, the Persian service of CHN reported on Tuesday. The sewage system is located in the southwest of the Achaemenid city near the city of Shiraz. The team dug down about five meters to reach the canal, Asadi said. A number of stone bas-reliefs have also been discovered during the excavations, he added. Asadi said that the sewage system branches off into many canals, which extend to the south and then turn to the east. News is emerging today (15 February 2012) of the theft in October 2011, from the Montreal Museum of Fine Arts, of two pieces, one of them a "Persian low relief of the head of a guard, dating from the fifth century BC. It is made of sandstone, and estimated to be worth hundreds of thousands of dollars". Surveillance video of the Montreal Museum of Fine Arts from Oct. 26, 2011 shows a suspect in the museum that police and the museum believe may have stolen two archaeological sculptures, a Persian bas relief and a Roman head of a man that are worth hundreds of thousands of dollars. British-based AXA Art, which is insuring the objects, hopes the public will recognize the individual and call police. The company is offering substantial rewards for the return of the objects and for the arrest of the suspect. Archaeologists have unearthed an ancient palace dating back to the Achaemenid dynasty in Dahaneh Gholaman located in Iran's southeastern province of Sistan-Baluchestan. 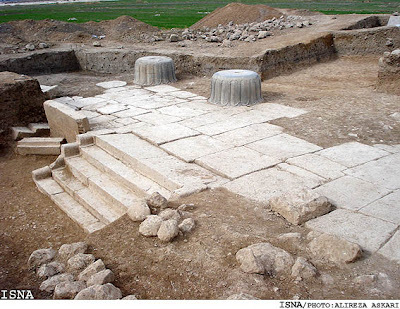 Comparing the structure in the Dahaneh Gholaman site with Achaemenid palaces in Takht-e Jamshid and Pasargaad proved that the newly-found site dates to the Achaemenid era, said Kourosh Mohammadkhani, leader of the archeological team, IRNA reported. He added that the finding is the most significant achievement in the current phase of the recent study. 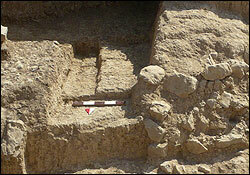 The Dahaneh Gholaman site comprises of 54 ancient structures, most of which were discovered during the years 1959 and 2008. Takht-e Jamshid (Throne of Jamshid) or Persepolis was the ceremonial capital of the Achaemenid Empire (550-330 BCE) which is located in Iran's Fars Province. Pasargadae was also the capital of another Achaemenid king, Cyrus (559-530 BCE), and is the location of his tomb. Recent research has shown that Achaemenid engineers constructed the city to withstand a severe earthquake. The Freer Gallery of Art and the Arthur M. Sackler Gallery Archives (Freer|Sackler Archives) received a grant from the Smithsonian Institution's Collections Care and Preservation Fund to aid in the preservation of the Herzfeld squeezes in the Archives, which date from 1911-1934. The squeezes contain Arabic script, Middle Persian, and Cuneiform impressions from archaeological sites: Bastam, Isfahan, Rayy, Samarra, Shiraz, Sunghur, Taq-i Bustan, Tus, Sarpul, Pasargadae, Persepolis, Naqsh-i Rustam, and Paikuli. See today's notice of updates on Ernst Herzfeld Online Resources by Rachael Cristine Woody on the Smithsonian blog. After several decades out of print, Oriental Institute Publication 69, Persepolis II: Contents of the Treasury and Other Discoveries, has been digitally reprinted. An Adobe Portable Document Format (pdf) version is also available for download. There are some very exciting activities happening around the Freer|Sackler Gallery, and in the Archives specifically. I am going to unveil to you my favorite object. I know I say that about a lot of the collections I show you, but this object really is an amazing specimen. Let me introduce to you squeeze 50A. For you to better understand, below are a couple definitions. A squeeze: is a series of sheets of paper that are layered on top of each other and moistened to create a wet pulp affect. This substance is pressed upon the inscriptions capturing the impressionistic writing like a 3-dimensional negative affect. These inscriptions typically cover the ancient culture's mythology, and histories. The squeezes in the Ernst Herzfeld papers are roughly 80-100 years old. The squeezes have been made out of varying qualities of paper from very high grade, to cigarette paper Herzfeld must of had to use in a pinch. The squeezes have since been transported around the world, squished in non-archival approved ways, and suffer from various issues that affect all paper products. Squeezing: Here, you see Herzfeld and his team on ladders applying the wet paper to the monuments of ancient Iran. Ernst Herzfeld: Archaeologist, art historian, and architect who excavated pre-Islamic and early Islamic sites. Iran's Center for the Great Islamic Encyclopedia (CGIE) has published Persian translations of a number of Persepolis petroglyphs. The inscriptions have been translated by Iranian linguist and inscriptions expert Abdolmajid Arfaei and published in a book titled Translations of Persepolis Walls. In an interview with ISNA News Agency, Arfaei said that the book contains 164 texts translated between 1998 and 2003. “The original texts belong to Iran's National Museum and there might still be some inscriptions which have not been translated,” Arfaei said. 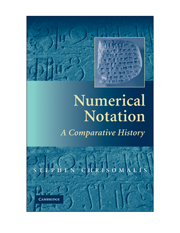 “The book includes Persian and English introductions as well as a Persian grammar section,” he added, saying that the English preface contains information on the original location of the inscriptions and the people who used them during the Achaemenid era. Arfaei who is an Elamite language expert and the founder of the Inscriptions Hall of Iran's National Museum has also translated over 2,500 Persepolis inscriptions, which are housed at the University of Chicago. His Decree of Cyrus the Great is a detailed account of the inscriptions on the Cyrus Cylinder, considered to be the world's first charter of human rights. Riemerge una parte sepolta della città, grazie agli scavi compiuti dagli archeologi italiani. Intervista a Pierfrancesco Callieri, direttore della missione. Destruction of Persepolis stone barrier denied, TEHRAN, June 5 (MNA). An official of the Parsa and Pasargadae Research Center (PPRC) denied the destruction of a stone from the staircase structure in the Council Hall at Persepolis last week. A block of stone from the northern stairway structure of the Council Hall was removed in the course of a restoration project that had been taking place over the past few weeks, the official, who requested anonymity, told the MNA. Italian archeologists find commoner’s neighborhoods in Persepolis , adnkronos.com, Venerdì 5 Giugno 2009. Rome – A joint Iranian-Italian archeological mission in Iran has made an exceptional discovery: the archeologists have found the first traces of the urban settlement in Persepolis, one of the five capitals of the Achaemenid Empire in ancient Persia, the construction of which began in 520 BC under the Emperor Darius the Great and lasted almost seventy years. In an interview with the “Tehran Times”, translated by the magazine “Archeologia Viva” (Giunti Editore), the Italian director of the mission, Pierfrancesco Callieri, professor of Archeology and Iranian Art History at the University of Bologna, affirmed that the new findings at the Persepolis site have furnished initial information on the city and on the neighborhoods where the common people lived. During the course of the excavations of the flat area at the foot of the Great Achaemenid Terrace and about 1 km from here, the team led by Professor Callieri discovered the first traces of a residential area which could correspond to the city of Mattezish, mentioned in the Elamite tablets in Persepolis. During the Achaemenid period (6th- 4th century BC), all the people working for the Imperial Court lived here, from functionaries to workers. Professor Callieri said that in one of the two excavation sites, “we localized a noteworthy structure, probably the walls of one of the building complexes of the city” instead in the other sites the archeologists localized “an artisan area with an oven and various waste ditches, surely connected to the work activities of the area as we found various ceramic pieces but also fragments of animal bones”. Achaemenid Persian Griffin Capital at Persepolis, Posted by Patrick Hunt, Archaeolog, May 4, 2009. One of the most impressive yet enigmatic surviving capitals from Persepolis is an Achaemenid masterpiece: the double griffin protome capital. On the one hand, there ought to be more than one of these griffin capitals from before the 330 BCE destruction, although it seems that only this extant one is intact. On the other hand, it is possible that only one was sculpted, since no other griffin protome fragments exist from Persepolis. A few archaeological accounts suggest its emplaced context at Persepolis was from the Apadana, although this cannot be proven since only 13 of the 36 (arranged 6 x 6) columns have survived, given the “conflagration…and catastrophic end” recorded under Alexander. More than a few scholars, including Wiesehöfer, maintain that numerous structures at Persepolis were not destroyed in 330 but only parts thereof and that some use continued thereafter. South Korean Diplomat Arrested with a Stolen Stone Relief from Persepolis while Leaving Iran, CAIS NEWS: Latest Archaeological and Cultural News of Iran and the Iranian World, 04 March 2009. LONDON, (CAIS) -- The 3rd Secretary of the South Korean Embassy in Iran has reportedly tried to smuggle a priceless relic dating to the Achaemenid dynastic era out of Iran. Customs officials in Shiraz Airport found the relic in the South Korean diplomat's luggage during check-in, before the diplomat succeeded in transporting the priceless relic of Persepolis, Persian daily Tabnak reported on Tuesday. Iranian Police, however, had to release the diplomat due to his diplomatic immunity, the report added. “Customs officials in Shiraz Airport found an Achaemenid relief depicting the top section of head of an Achaemenid soldier, weigh 2kg from Persepolis in the luggage of the 3rd Secretary of the South Korean Embassy in Iran,” Shiraz public and revolutionary prosecutor, Jaber Banshi told IRNA. “The relic has been delivered to the provincial cultural heritage office, but no cultural official has filed a complaint so far,” he added. The S. Korean embassy declined to comment on the issue when contacted by Press TV. The customs officials sent the stolen piece back to the ruins of Persepolis. It is not clear how the diplomat obtained the relic, despite the claim by IRNA that the he picked it up while visiting the Persepolis. LONDON, (CAIS) -- The case of destruction of part of Persepolis and the theft of an artefact are still open, and it is under investigation by the Marvdasht Public Prosecutor's Office, reported the Persian service of ISNA. Until now 16 people from the excavation group and Security Unit office have been arrested, questioned and released on bail pending further investigations. The case was initially opened as the result of public and Iran Cultural Heritage, Handicraft and Tourism Organisation's complaints, said Kazam Akrami from the Marvdasht Public Prosecutor's Office. Akrami with commented on the lack of CCTV in the area and said we have interrogated security officers who are responsible for safeguarding the site and they have relinquished themselves from any responsibility, since they claim the robbed grave and its' contents were not reported to the Security Unit by the archaeologists, therefore the site was not included in the protection coverage zone.? Afshin Yazdani from Archaeological Research Centre, back in January asserted that the Security Unit was aware of their excavation and the discovery of the grave. It is not clear whether the archaeologists from the Iran Archaeological Research Centre had a duty to report their findings to the security unit, or if they had reported it, the security unit are denying their claim. The robbed grave is only 100 meters away from their station. The theft and destruction of the site took place on 17th January, after the discovery of an Achaemenid dynastic grave by archaeologists. The grave contained a skeleton, a ceramic beaker and a burner. The beaker was contained a grave offering which is now missing. Archaeologists have found broken pottery near the grave, which could be the beaker - maybe it was broken in order to remove its' contents. Currently the broken pieces are in process of being reassembled and it is now 80% complete, to verify if they belong to the missing beaker. The point of reference is the pictures taken by archaeologists on the day of crime. This is not the first time thieves have targeted Persepolis. The most puzzling theft from Persepolis was taken place in March 2006, when police seized a double-bull-headed capital in Kerman. 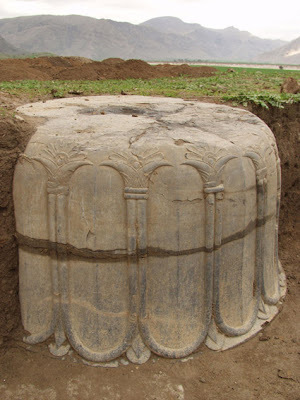 The Persepolitan-capital was discovered in Kerman by vigilantes and reported to police. The artefact was bound to leave Iran for West. Neither, the ICHHTO, Persepolis officials or any of the Islamic Republic's state controlled news agencies had reported the robbery -- nor did they offer any explanation as how such a colossal capital which weighs few tones could be removed from Persepolis complex without the officials' knowledge. during their latest excavation at the ancient town of Parsa near Persepolis. Remains of a wall were brought to light at one of the trenches dug by the Iranian-Italian joint archaeological team searching for the residential area of commoners outside the palaces of Persepolis. It is believed to be one of the boundary walls of the city of Parsa. 3. Bruce Lincoln’s, Religion, Empire, and Torture. 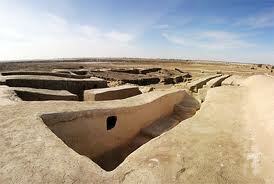 A report on this year's excavations at Noorabad, Mamasani, Fars province. Despite all oppositions made by Iran regarding the sale of the head of the Achaemenid soldier, it has been sold in Christie’s auction in London. And see also: The Denyse Berend Persepolis relief fragment is for sale at Christie's, and Iran boycotts bas-relief sale at Christie's, and UNESCO not Support Iran to Retrieve its Achaemenid Soldier, and IN THE HIGH COURT OF JUSTICE QUEEN'S BENCH DIVISION, Royal Courts of Justice, Strand, London, WC2A 2LL, 1st February 2007. B e f o r e : THE HON. MR JUSTICE EADY. Between: The Islamic Republic of Iran, Claimant - and - Denyse Berend, Defendant: HTML VERSION OF JUDGMENT England and Wales High Court (Queen's Bench Division) Decisions, 1st February 2007, and British court's decision on the ownership of the Persepolis relief fragment bought in 1974 by Denyse Berend, as well as earlier comments by Derek Fincham, of Illicit Cultural Property: No renvoi in Iran v. Berend, and Martin George, of ConflictOfLaws.Net: Rejecting Renvoi: Iran v Berend. Sun, 07 Oct 2007 08:18:4. "With a joint project estimated to cost 30 million euros, Iran and Austria will restore Iran's foremost historic site, Persepolis." 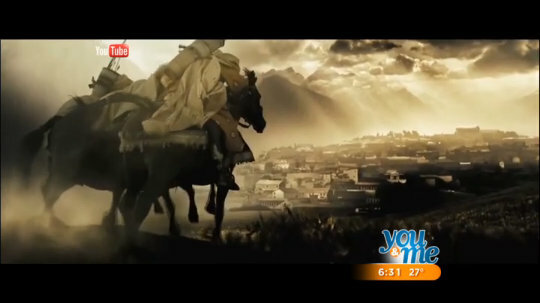 Sun, 02 Sep 2007 11:14:25 (PressTV). Tehran, 3 September 2007 (CHN Foreign Desk). Wed, 18 Jul 2007 19:47:36 (PressTV). Thu, 07 Jun 2007 18:37:05 (PressTV). ehran, 13 May 2007 (CHN Foreign Desk). Thu, 22 Mar 2007 22:52:10. © Press TV 2007. "A new outdoor museum in the ancient city of Persepolis, in southwestern Iran, is scheduled to open during Nowruz holidays, showcasing items belonging to Iran's Achaemenid and Sassanid eras." BY A STAFF REPORTER Friday, February 16, 2007 8:42:24 IST. © 2007, Cybernoon. "... The Jeejeebhoy Dadabhoy Agiary at Navy Nagar was the scene of chaos yesterday. The ancient city of Persepolis, Persia, is being re-created in all its glory and splendour ..."
England and Wales High Court (Queen's Bench Division) Decisions, 1st February 2007. British court's decision on the ownership of the Persepolis relief fragment bought in 1974 by Denyse Berend. Update: Derek Fincham, of Illicit Cultural Property, comments on the case : No renvoi in Iran v. Berend. Update: Martin George, of ConflictOfLaws.Net, comments on the case : Rejecting Renvoi: Iran v Berend. "MEXICO CITY, Feb 2 (Reuters Life!) - Fascinated by cultures as old as their own, Mexicans are pouring into museum exhibitions in wonder at ancient Middle Eastern artefacts never before seen in the Western Hemisphere ... A stone plaque inscribed in cuneiform script from the ancient city of Persepolis, destroyed by Alexander the Great in 330 BC, is one of the highlights. 'I didn't know Iran had such fabulous stuff, like gold cups and statues,' said retired clerk Sergio Zavala, 68, on his fourth visit to the Persia display. 'I always used to think of Iran and Iraq just as places of conflict,' he said ..."
Persépolis, arquitectura celestial o terrenal? by Manel Garcia Sanchez. Preprint of an article to appear in AZARA, PEDRO; FRONTISI-DUCROUX, FRANÇOISE; LURI, GREGORIO (eds. ), Arquitecturas celestiales, Actas del congreso internacional celebrado en el Centro de Cultura Contemporánea de Barcelona, 14-16 de septiembre de 2006 (sous presse, 2007). "Persepolis, one of the Achaemenid empire capitals has been seen as a secret and ritual city, designed for the celebration of the Zoroastrian New Year Festival or Now Ruz on the vernal equinox. The silence of the classic authors, of the biblical books and the ancient near east tablets, as well as the majestic relieves in which the royal hero fights against bestiaries, which are the symbol of the Evil Spirit, had been used as an evidence to confirm that suggestive hypothesis. Nevertheless, if we interpret the Persepolitan iconography in the light of what we know about the religion and the ideology of the Achaemenids and if we do not find dark means in the silences of the sources, we find that the design of the city responds more to a political, ideological and earthly functionality than a wish of reflecting a celestial architecture..."
"In a formal statement, London’s High Court will be delivering its recent ruling on bas-relief of the Achaemenid soldier, which was announced on Jan. 19, 2007, to Iran in two weeks. According to Omid Ghanami, director of the Legal Department of Iran’s Cultural Heritage and Tourism Organization (ICHTO), the Organization is waiting to receive the written verdict to make follow-up decisions. He also said that Iran wills take actions against the court’s ruling if given the right to object to the final decree..."
"LONDON (Reuters) - Iran on Friday lost a legal battle against an 85-year-old French widow over a piece of carved limestone from the ancient Persian capital of Persepolis. London's High Court ruled in favour of Denyse Berend, who bought the artefact in 1974, in a case brought against her by the Iranian government which sought to reclaim the relief fragment..."
"A stone carving of the head of a guardsman from the ancient palace of Persian kings at Persepolis is at the centre of a High Court battle that could have worldwide repercussions for museums and art collections. For more than 30 years, the 5th century BC relief has been in the possession of a Frenchwoman who bought it at an auction in New York in 1974 and displayed it on her living room wall..."
"LONDON, January 16 (IranMania) - Head of Iran’s Cultural Heritage, Handicrafts and Tourism Organization’s Research Center has said that enthusiasts, cameramen and researchers cannot be banned from entering historical monument of Takht-e Jamshid (Persepolis) in Fars province. Seyyed Taha Hashemi told ISNA on the sidelines of the inaugural ceremony for Research Week that the competence of cultural and tourism stations is determined by the fact that they remain vigilant against any threat and at the same time they permit the entry of researchers and visitors to the sites..."
"Tehran, 15 January 2007 (CHN Foreign Desk) -- The biggest horse riding festival in Iran will be held in April/May 2007 close to Persepolis historic complex in Iran’s Fars province under the joint cooperation of sport tourism committee of Iran’s Cultural Heritage and Tourism Organization (ICHTO), Iran’s Equestrian Federation, and UNESCO..."
"LONDON, January 15 (IranMania) - The reservoir of the Sivand Dam will be filled, pending archaeologists’ decision at a seminar to be held in Tehran on January 20, the Cultural Heritage, Tourism, and Handicrafts Organization (CHTHO) Research Center director said at a press conference, MNA reported. “All the archaeologists that participated in the rescue excavations of the Bolaghi Valley will present their reports during the seminar. If the reports indicate that the rescue excavations have been completed, the filling of the dam will begin,” Taha Hashemi added..."
"LONDON, January 4 (IranMania) - A team of experts from the Parseh and Pasargadae Foundation announced that they had successfully removed the red stains from the floor and walls of the Hadish Palace of Xerxes in Persepolis, MNA reported. The stains were left by a film crew shooting a TV series in late December that used red liquid to represent blood in a scene..."
After studying different alternatives for saving the cultural landscape of the historic site of Naqsh-e Rostam against railway construction, experts of Parse-Pasargadae Research Center concluded that the most effective way to prevent the railway from intruding the historic landscape of this Achaemenid site is to construct a 6-kilometer-long tunnel from Sivand to Shoul village and direct the train through the tunnel. Announcing this news, Hassan Rahsaz, an expert in Parse-Pasargadae Research Center explained that the tunnel could be constructed at a distance of 4 to 5 kilometers from Naqsh-e Rostam without posing any threat to its ancient structures..."
Persepolis Fortification Archive Project Annual Report for 2016-2017 has appeared. The Ritual Landscape at Persepolis. Mark B. Garrison. 2017. Extraction & Control: Studies in Honor of Matthew W. Stolper. Edited by Michael Kozuh, Wouter F. M. Henkelman, Charles E. Jones, and Christopher Woods. 2014. Seals on the Persepolis Fortification Tablets, Volume I: Images of Heroic Encounter. Mark B. Garrison and Margaret Cool Root, with contributions by Charles E. Jones. 2001. Persepolis and Ancient Iran (967 Photographs) 1976. Aramaic Ritual Texts from Persepolis. R. A. Bowman. 1970. Persepolis III: The Royal Tombs and Other Monuments. E. F. Schmidt. 1970. Persepolis Fortification Tablets. R. T. Hallock. 1969. Persepolis II: Contents of the Treasury and Other Discoveries. Erich F. Schmidt with contributions by Sydney P. Noe et al., Frederick R. Matson, Lawrence J. Howell, and Louisa Bellinger. 1957. Persepolis I: Structures, Reliefs, Inscriptions. Erich F. Schmidt with contribution by F. R. Matson. 1953. Persepolis Treasury Tablets. George G. Cameron. 1948. The Persepolis Expedition. Erich F. Schmidt. Originally published in 1941. The Treasury of Persepolis and Other Discoveries in the Homeland of the Achaemenians Erich F. Schmidt. 1939. A New Inscription of Xerxes from Persepolis Ernst E. Herzfeld. 1932. Download the Exhibition Brochure for Persepolis: Images of an Empire. Read the rest of this article at Rick St, Hilaire's page. WASHINGTON - The US Supreme Court on Wednesday ruled that Americans injured in a 1997 suicide bombing in Jerusalem cannot seize ancient Persian artifacts from a Chicago museum to satisfy a $71.5 million court judgment against Iran, which they had accused of complicity in the attack. The justices, in an 8-0 ruling, upheld a lower court decision in favor of Iran that had prevented the plaintiffs from collecting on the judgment, which Tehran has not paid, by obtaining antiquities held at the University of Chicago's Oriental Institute. The important Persian cultural artifacts, on loan to the museum since the 1930s, include clay tablets boasting some of the oldest writing in the world. Be the first to know - Join our Facebook page. Justice Elena Kagan did not participate in the decision. The decision could make it harder for plaintiffs in other cases arising from militant attacks overseas to seek compensation by seizing and selling off cultural relics owned by foreign countries. The case required the Supreme Court to determine what types of assets are immune from seizure under the Foreign Sovereign Immunities Act. That 1976 federal law largely shields foreign governments from liability in American courts, except for countries like Iran that have been designated by the US government as state sponsors of terrorism. Iran is one of several countries and organizations ordered by US courts to pay damages in similar cases, though such orders have been difficult to enforce. Supreme Court Hears Rubin v. Iran. Feds Say Taking Cultural Property A "Big Deal." Petitioners Want Justice, Arguing "It's Not About Antiquities." Can American victims of terrorism seize and sell ancient Persian antiquities located at the University of Chicago to satisfy a court judgment against Iran? That's the question the United States Supreme Court considered on Monday in the case of Rubin v. Islamic Republic of Iran, a case examining the mechanics of the Foreign Sovereign Immunities Act (FSIA). Foreign countries generally are immune from lawsuits filed in American courts. But the FSIA outlines exceptions to this rule, including a terrorism exception codified at 28 U.S. Code § 1605A. Congress penned this section in 2008 to allow plaintiffs to sue designated state sponsors of terror that caused injury, harm, or death. But are the assets that can be attached to execute the court judgment limited to those that are "used for a commercial activity" as specified by § 1610(a)? Or can the assets be any kind whatsoever, including antiquities housed at a museum? That was the topic of oral argument in the Rubin case. Rubin pits American victims of a Jerusalem suicide bombing against the country of Iran, a country designated by the US government as a state-sponsor of terror. Hamas claimed responsibility for the Iranian sponsored attack in 1997, and a federal district court in Washington, DC in 2003 awarded the plaintiffs $71.5 million in a default judgment, holding Iran culpable. Read about the lengthy and complex case history here. These days, the Supreme Court is known as a “hot bench”: Lawyers who argue there usually have to respond to a barrage of questions from all sides. That fast and furious questioning can make it hard for advocates to advance their arguments, but it also makes it easier for both the attorneys and spectators to figure out what the justices care about, and how they might rule. The flip side of this is that when the justices are quieter, the advocates have more time to talk, but it’s harder to know what the justices are thinking. The University’s Oriental Institute (OI) is involved in an ongoing Supreme Court case in which American terrorist victims are seeking compensation from the Iranian government through seizing Iranian artifacts from the OI and the Field Museum. In September 1997, three suicide bombers associated with the Palestinian terrorist group, Hamas, carried out an attack on a shopping mall in Jerusalem. Among those affected were eight United States citizens, who later filed a civil action case in a U.S. court against the government of Iran and its involvement in providing financial support to the bombers. Efforts on returning Iran's centuries-old stone tablets will soon pay off, an official at Iran’s Cultural Heritage, Handicrafts and Tourism Organization said. "The tablets—known as the Persepolis Collection—were taken out of country at different periods of time and under different excuses," said Mohammad Reza Kargar, director of the Museums and Historical Moveable Properties Office at ICHHTO, IRNA reported. "Restitution of the tablets has been a controversial issue, but the saga is nearing its end now." While historical objects taken of a country can be tracked via various channels, such as Interpol, the process is long and complex as it requires the plaintiff to first provide proof of ownership and then supply evidence that the objects were taken out illegally. "Even more, the process is costly," Kargar said. The Persepolis Collection includes about 30,000 clay tablets and fragments that Iran loaned to the Oriental Institute in 1937 for research, translation and cataloguing. It contains 300 tablets dating back to the Achaemenid era (550–330 BC), which are impressed in cuneiform and record administrative details of the ancient Persian Empire. Eight Americans injured in a Hamas suicide bombing in 1997 and their families had moved to seize the artifacts to satisfy a US court ruling that Iran owed the victims $71.5 million for its alleged involvement in the attack. However, several US-based media, including the Chicago Daily Law Bulletin, reported last summer that the 7th US Circuit Court of Appeals held that the Field Museum of Natural History and the University of Chicago’s Oriental Institute are not required to turn over the antiquities to the eight victims. Kargar noted that Iran is awaiting one more court ruling related to the Persepolis Collection, "which is expected to be in our favor". A large haul of Iran’s stolen artifacts have been repatriated over the past two years. A shipment of 349 ancient relics was returned from Belgium in December 2014 after 33 years, following a ruling by a court in Brussels. In April 2015, over 100 historical artifacts taken from the archeological site of Choghamish in Khuzestan Province were returned by the University of Chicago’s Oriental Institute, after The Hague in the Netherlands ruled in favor of Iran and obliged the US to repatriate the objects. In July 2015, the government in Rome returned a shipment of 30 relics dating back to the pre-Islamic era, while about 73 smuggled relics, including seal impressions from the Sassanid era (224–651), were returned to Tehran in May. Iran’s cultural heritage officials have urged Iranian expats to report stolen Iranian artifacts to help bring the relics back home. They have been called upon to use the online portal, www.ichto.it, to share information they may have regarding Iranian stolen artifacts. CHICAGO — In a rare case, a museum collection will not be used to satisfy a judgment against another nation - in this case, the country of Iran, which has been accused of having sponsored a 1997 terrorist attack in Jerusalem in which eight Americans were injured. On July 19, the U.S. Seventh Circuit Court of Appeals ruled Chicago's Field Museum and the University of Chicago’s Oriental Institute are not required to return ancient Persian artifacts over to the victims of the attack. The artifacts, if turned over, would have helped to satisfy a judgment of $71.5 million against Iran. The appeals court upheld a lower court's ruling that the survivors of the 1997 terrorist attack, which has been blamed partly on Iran, cannot seize the Persian antiquities which include a large Persepolis Fortification tablet with cuneiform text from more than 2,000 years ago. The Americans who had sued Iran were injured in the September 1997 Hamas suicide bombing in which bombers, affiliated with the Palestinian group Hamas, detonated suicide bombs in a pedestrian mall in Jerusalem. “This is a rare case,” said Derek Fincham, Associate Professor of Law at the Houston College of Law. He said using museum or university collections to satisfy judgments has rarely been successful. “The 7th Circuit in this case had already denied the plaintiff’s efforts to secure the judgments," he said. "In other words, they won on the merits because Iran did not contest the case." The ruling was formally a denial of an en banc rehearing, or a hearing before all the judges of the appeals court, by a larger number of the 7th Circuit judges, not just the three judge panel that decided the earlier case. “En banc appeals are rarely successful, because three judges have already decided the case and rarely will a case merit the full complement of appeals court judges in any circuit,” Fincham said. Two of the four collections of artifacts sought by the victims are not owned by Iran, the court stated. The country does own a third collection, but in 1970 the Oriental Institute returned most of those artifacts under the advice of the U.S. State Department. A fourth collection, which includes approximately 30,000 clay tablets and segments, was loaned to the Oriental Institute for research from Iran in the 1930s. The court wrote that the collection is owned by Iran and is in the possession of the University of Chicago and are immune from attachment and execution as property of a foreign state under the Foreign Sovereign Immunities Act. “Plaintiffs will always be concerned with how they can get paid when they win, but that is exceedingly hard when as in this case, Iran did not even participate in the litigation as a defendant,” Fincham said. He said it is a unique situation where the defendant must not really have any commercial relationship with the United States for it to work. “I think the case was rightly decided. A ruling otherwise would have had devastating consequences for the loan of artwork and study collections at museums and universities,” Fincham said. Fincham said the tablets are an important research collection, but doesn’t suspect that any of the tablets are display quality. “Rather, they tell us valuable information about Persepolis, the ancient city, and the Persian culture,” Fincham said. The market value of the tablets is unsure, but there are thousands of fragments. “Had they been sold, they would have probably gone to private collectors who may not have been able to care for them, study them or even preserve them as a set so they can be studied,” Fincham said. Fincham said the court’s decision was a good result for the artifacts in question. “The poor victims of the attacks, though, will have to seek a remedy some other way,” he said. A federal appeals court has ruled that terrorism victims can’t seize priceless Iranian artifacts held by the University of Chicago in fulfillment of a judgment against the Islamic Republic of Iran. This is a good decision in practical terms, but it was tailor-made to protect the collection and the university. And it creates a conflict with another Court of Appeals, opening the door to potential Supreme Court review. The case arose as a result of a lawsuit by family members of victims of a 1997 Hamas suicide bombing in Jerusalem. The victims’ families sued Iran on the theory that it supported Hamas. Iran didn’t appear to defend itself in the suit, and a federal court awarded the families a $71.5 million, which hasn’t been paid. The families’ lawyers have been looking around the country for assets belonging to the government of Iran that they could attach, seize and sell to get the damages they are owed. Advisedly or not, they decided to go after four collections of antiquities that supposedly belonged to Iran but are held by Chicago-area museums. The case ended up in the U.S. Court of Appeals for the Seventh Circuit. It first took three of the four collections out of the case, in two instances because it held they didn’t actually belong to Iran, and in the other because the collection was physically returned to Iran by the University of Chicago. That left the Persepolis collection, one of the great caches of literary artifacts from the ancient world. In 1930, the Shah of Iran lent the collection of tablets to the University of Chicago for study. It remains in the Oriental Institute of the university, where it has garnered significant scholarly attention and helped produce important scholarship on ancient Iran. In general, a foreign government’s assets can’t be seized in the U.S. in fulfillment of a judgment. That’s a basic principle derived from the doctrine of sovereign immunity, which says that states can’t be dragged into court without their permission. But sovereign immunity has exceptions -- and the families pointed to two possible exceptions in support of their claim to seize the antiquities. American victims of a 1997 terrorist bombing can't claim ancient Persian artifacts held at the University of Chicago to satisfy a multimillion-dollar judgment against Iran for its role in the attack, the U.S. Court of Appeals for the Seventh Circuit ruled. A three-judge panel found on July 19 that there is no "freestanding" exception in state-sponsored terrorism cases to the immunity that shields foreign governments under U.S. law. The Seventh Circuit's decision conflicts with the Ninth Circuit, which held earlier this year that there was such an exception. The circuit split sets the stage for possible review by the U.S. Supreme Court. Last year, the justices ruled in a state-sponsored terrorism case, finding that victims with judgments against Iran could collect nearly $2 billion in Iranian assets held in a U.S. bank. At issue in the Seventh Circuit case is a collection of approximately 30,000 clay tablets from the ancient Persian city of Persepolis. Iran in 1937 loaned the Persepolis Collection to the University of Chicago's Oriental Institute, where it remains. The plaintiffs — victims of a 1997 bombing in Jerusalem and their families — won a $71.5 million default judgment in federal court in Washington, D.C. Iran doesn't usually participate in terror litigation in U.S. courts and did not pay the judgment. Iran owes hundreds of billions of dollars in judgments in state-sponsored terrorism cases. Lawyers for the plaintiffs went to the U.S. District Court for the Northern District of Illinois to claim what they contended were Iranian assets within the court's jurisdiction — the Persian artifacts at the University of Chicago. They claimed other collections at the university and the Field Museum of Natural History in Chicago as well, but those are no longer part of the case. Foreign governments are generally granted immunity against civil claims in U.S. courts, but there are exceptions, including in terrorism cases. The Seventh Circuit panel said the federal Foreign Sovereign Immunities Act did not include a "freestanding" exception in terrorism cases, agreeing with arguments advanced by lawyers for the University of Chicago, Iran and the U.S. government. Judge Diane Sykes, writing for the panel, said plaintiffs had to meet the criteria of other exceptions under the immunities law. The plaintiffs argued the artifacts fell under a "commercial activity" exception, but the court disagreed, finding that the Iranian government wasn't using the artifacts for commercial purposes in the United States. Seventh Circuit Judge William Bauer and Chief Judge Michael Reagan of the U.S. District Court for the Southern District of Illinois, sitting by special designation, joined the decision. Asher Perlin of Florida Professional Law Group in Hollywood, Florida, who argued for the plaintiffs, said in an email that they are weighing options for "further review." "Obviously we are disappointed with the majority's decision," Perlin said. Baker & McKenzie partner Matthew Allison argued for the University of Chicago. MoloLamken founding partner Jeffrey Lamken argued for Iran. Neither was reached for comment on Wednesday. A full sitting of the Seventh Circuit won't hear the case. Given the split with the Ninth Circuit and the fact that the court reversed earlier precedent, the case went before all active judges for a vote. But five of the 10 active judges recused — Chief Judge Diane Wood and Judges Richard Posner and Frank Easterbook teach at the University of Chicago; Judges Ilana Rovner and Joel Flaum had other conflicts — so an en banc sitting was not possible. Judge David Hamilton dissented from the denial of en banc review. He wrote that the immunities law was ambiguous and that the Ninth Circuit reached the right conclusion. "We must choose one side or the other," Hamilton wrote. "The balance here should weigh in favor of the reading that favors the victims. We should not attribute to Congress an intent to be so solicitous of state sponsors of terrorism, who are also undeserving beneficiaries of the unusual steps taken by the Rubin panel." A federal appeals court Tuesday declined to clear the way for victims of a terrorist attack financed by Iran to use ancient Persian artifacts to help satisfy a $71.5 million judgment against that nation. The 7th U.S. Circuit Court of Appeals held the Field Museum of Natural History and the University of Chicago’s Oriental Institute are not required to turn over the antiquities to the eight victims. Iran does not own two of the four collections sought by the victims, a panel of the court wrote. Iran owns a third collection, the panel wrote, but the Oriental Institute returned most of those artifacts in 1970 and the remainder within the last two years at the direction of the U.S. State Department. The fourth collection includes about 30,000 clay tablets and fragments that Iran loaned to the Oriental Institute in 1937 for research, translation and cataloguing, the panel wrote. The Persepolis Collection, it wrote, is owned by Iran and is in the possession of the University of Chicago. But as the property of a foreign state, these artifacts are immune from attachment and execution, the panel held, citing the Foreign Sovereign Immunities Act. The panel conceded there are exceptions to this general rule. A litigant seeking to satisfy a judgment against a foreign state may take property “used for a commercial activity in the United States,” Judge Diane S. Sykes wrote for the panel, quoting Section 1610(a) of the FSIA. However, she wrote, Iran has not used the artifacts in the Persepolis Collection for any commercial purpose. Citing Bennett v. Islamic Republic of Iran, Nos. 13-15442 and 15-16100, 2016 WL 3257780 (9th Cir. June 14, 2016), the panel also conceded that the 9th Circuit in San Francisco last month held that Section 1610(g) of the FSIA allows victims of state-sponsored terrorism to attach assets even if they are not used for commercial purposes. It disagrees with the 9th Circuit’s ruling that Section 1610(g) is a freestanding exception to execution immunity, the panel wrote. The panel noted that the 9th Circuit’s majority cited two 7th Circuit decisions — Gates v. Syrian Arab Republic, 755 F.3d 568 (7th Cir. 2014), and Wyatt v. Syrian Arab Republic, 800 F.3d 331 (7th Cir. 2015) — to bolster its holding in Bennett. “To the extent that Gates and Wyatt can be read as holding that Section 1610(g) is a freestanding exception to execution immunity for terrorism-related judgments, they are overruled,” Sykes wrote. Joining the opinion were Judge William J. Bauer and Chief U.S. District Judge Michael J. Reagan of the Central District of Illinois, who sat on the 7th Circuit by designation. Because its opinion overrules 7th Circuit precedent and conflicts with the 9th Circuit’s ruling on the issue, the panel wrote, it circulated its opinion to all the active judges on the court to consider the possibility of a rehearing en banc. But Chief Judge Diane P. Wood and Judges Richard A. Posner, Joel M. Flaum, Frank H. Easterbrook and Ilana Diamond Rovner did not participate, the panel wrote, and therefore a majority of the active judges did not vote for the entire court to rehear the case. The panel did not say why the five judges did not participate. Judge David F. Hamilton did not serve on the panel, but he used a dissent from the denial of en banc review to object to the panel’s holding. The text of Section 1610(g) is ambiguous and, therefore, both the 7th Circuit’s and the 9th Circuit’s interpretations of that provision are reasonable, Hamilton wrote. “The courts must choose between two statutory readings: [O]ne that favors state sponsors of terrorism and another that favors the victims of that terrorism,” he wrote. Congress, he wrote, has extended the remedies for such victims over the years. “The balance here should weigh in favor of the reading that favors the victims,” he wrote. The plaintiffs were among the 200 people who were injured when three Hamas suicide bombers blew themselves up in Jerusalem in September 1997. Five other people were killed. The plaintiffs filed a lawsuit in federal court in Washington, D.C., seeking damages against Iran, which financed Hamas, and several individuals. In 2003, they were awarded $71.5 million in damages in a default judgment against Iran. The judgment amounted to more than $400 million when the punitive damages the individual defendants were ordered to pay were included. The plaintiffs have attempted to collect the judgment against Iran by seeking to attach its assets in the United States. In the lawsuit filed in federal court in Chicago, U.S. District Judge Robert W. Gettleman held there are no exceptions in either the FSIA or the Terrorism Risk Insurance Act of 2002 that allow the plaintiffs to attach the museum exhibits. The 7th Circuit panel agreed with Gettleman. The insurance act, the panel wrote, allows terrorism victims who obtain a judgment against the offending nation to execute on assets that are “blocked” by executive order under certain international sanction provisions. But there is no executive order blocking the artifacts sought by the plaintiffs, the panel wrote. Asher Perlin of Florida Professional Law Group PLLC in Hollywood, Fla., argued the case before the 7th Circuit on behalf of the plaintiffs. Matthew G. Allison of Baker & McKenzie LLP argued the case on behalf of the museums. Jeffrey A. Lamken of MoloLamken LLP in Washington, D.C., argued the case on behalf of the Iranian government. Benjamin M. Schultz of the U.S. Justice Department in Washington argued the case on behalf of the government. The United States took part in the case as amicus curiae supporting the position of Iran and the museums. Justice Department spokeswoman Nicole A. Navas declined to comment. Oriental Institute Director Gil J. Stein said he is pleased with the ruling. The Field Museum and the attorneys either did not have an immediate comment or could not be reached for comment. The case is Jenny Rubin, et al. v. Islamic Republic of Iran; Field Museum of Natural History, et al., Respondents, No. 14-1935. "The court recognizes the tragic circumstances that gave rise to the instant action, but finds that the law cited by plaintiffs does not offer the remedy they seek." With these words, Judge Robert Gettleman ended the Northern District of Illinois case of Jenny Rubin, et al. v. Islamic Republic of Iran, et al. v. The University of Chicago and The Field Museum of Natural History. The University of Chicago and The Field Museum won’t have to turn over ancient Persian artifacts in their possession to help resolve a legal settlement owed to survivors of a terrorist attack, a federal judge has ruled. In a long-running court battle, nine American victims of the 1997 attack in Jerusalem sued Iran, where the artifacts were excavated, for being a financial supporter of Hamas, the Palestinian extremist group. The victims won a multimillion-dollar court judgment. To collect on that, attorneys for the plaintiffs have been trying to gain control of Iranian assets in the United States, including artifacts the Chicago museum has had for decades, according to the ruling. In Thursday’s decision, U.S. District Judge Robert Gettleman held that the plaintiffs’ argument was flawed because there was no evidence that Iran has asserted ownership over the collections. “The court recognizes the tragic circumstances that gave rise to the instant action, but finds the law cited by the plaintiffs does not offer the remedy they seek,” Gettleman said in the decision. Keepers of the Chicago collections said the pieces were priceless and welcomed the court’s ruling. “These ancient artifacts...have unique historical and cultural value,” said Gil Stein, director of the University of Chicago’s Oriental Institute in a statement. The university “will continue our efforts to preserve and protect this cultural heritage,” he said. Once upon a time people used something called paper for writing all sorts of things, from love letters to secret sauce formulas to stockholder reports. It was when writing was just word-winding. They say some hyper competitive Silicon Valley companies (there was no other known kind) even went as far as hiring detectives to sort through paper trash of their competitors to patch together highly guarded business secrets. This paper was made of trees that grew wild in the nature-in places people of old used to call forests. There were all sorts of round trees and all kinds of flat paper. Something called deforestation saw to the end of these green forests and paper became rare and eventually extinct. People didn’t stop writing, they wrote even more. But instead of real paper, they started to use old software programs that nostalgically looked like pages of white paper on computer screens, but they were really nothing more than zeroes and ones, stored on primitive hard drives. As everyone knows those clunky computers eventually became obsolete too when we started to use glasses and tablets and watches and other things to record our blinkings and doings and thinkings. ...In 2006 Dr. Matthew Stolper, one of handful of specialists on Elamite language in the world, cleared his plate, assembled a stellar team of scholars from a number of American and European universities, embarked on the never-ending quest for (much) needed grants, and took on the emergency task of digitization of the Achaemenid archive-known as the Persepolis Fortification Archive Project (PFAP). Under Matt Stolper’s steadfast watch and with the moral support of his faithful friend, Baxter the Beast, the initial phase of cleaning, conserving and digitizing the archive is finally reaching critical mass and the next phase of making sense of the mass of generated data is kicking in-the old sprinkling of the water of life on dead bones. In the process, surprising new discoveries have come to light, among them finding the footprint of Udusana (Greek: Atossa), the quintessential Achaemenid royal woman (queen), who, according to the classical writers, was the eldest daughter of Cyrus the Great, the chief wife of Darius the Great, and the powerful mother of Xerxes (Persian: Xsayarsa, or Khshayarsha). Triple Crown of Persian royalty. These Persian administrative records, roughly 30,000 or so pieces from a single archive, dating from 509 to 493 BCE (from 13th to 28th regnal years of Darius the Great, about 16 years, with some references to the 7th regnal year)-conceptually likened to the bones of a dinosaur-have led to not just an understanding of the routine imperial administrative infrastructure, but all sorts of interesting things like art, language, religion, and society of the Persian Achaemenid Empire, that was unknowable merely from the traditional biblical and classical sources. The sort of raw data that the large cuneiform archives like the Persepolis Fortification Archive have been yielding is “Big Data”-datasets that are getting too big to process using classical computing techniques. Big Data is now being used in computer technology circles to refer to the latest advances in aggregating massive amounts of data from various sources and enabling researchers to mine and map data in amazing new ways-see what no one has seen before, ask questions no one has answered yet. On the academic side of the coin, Big Data research will eventually exponentially expand the newly-minted field of Digital Humanities. While virtualization and visualization of archival data from the Achaemenid royal chancelleries will not give us historical answers-at least not to what we think-it will, however, provide a richer context for understanding and interpreting the Big Data we have accidentally inherited and luckily recovered. This Big Data is also the playground of writers like me who troll the archival treasure troves for historical backstory to turn boring administrative records into sizzling stories about the adventurous lives and scandalous love affairs of the Persian royal sons and daughters-kings and their queens who once ruled the world-the real royal games of the only throne that really mattered. Masters of Asia. Achaemenid scholars have been spending years carefully reconstructing a clay dinosaur to restore Persians to the history of the world, and the Persian storytellers thankfully ride this paper-beast to restore the Persians to the story of the world. Dr. Stolper, now retired as of the end of 2013, is continuing as the head of the PFA Project, crisscrossing the globe on a mission to evangelize the immense impact of the ancient archive on Persian Achaemenid history and heritage. In recognition of his lifelong achievements and his tireless efforts in preserving and promoting the integration of knowledge from the Achaemenid Administrative Archives into mainstream classical and ancient Near Eastern (ANE) studies, there would be a celebration at the Oriental Institute tentatively scheduled for 28 April 2014. These types of events are normally planned for the local colleagues, students and patrons of the institute. This one, however, might just turn out to be a greater gathering of the friends of the Persepolis Fortification Archive Project, die-hard supporters of Persian history and heritage, and the who-is-who of the Persian Achaemenid studies. Tell Parnakka (probably the paternal uncle of Darius the Great and the first chief of the imperial administrative archives at Parsa) to order more Shiraz wine for the feast. Persians are coming. Abdul Majid Arfaei, a professor of Ancient Near Eastern languages and cultures, has translated ‘The Inscriptions of Persepolis’ in four volumes which have been handed over to the Cultural Heritage Organization for publication. IBNA: Abdul Majid Arfaei said he has finished translating 647 tablets, related to the era of Darius the Great, which were read by Richard Treadwell Hallock. The works are included in the first volume of the series. Richard Treadwell Hallock, Elamologist and Assyriologist, was a professor of Chicago University. The late professor, who read the bulk of the Persepolis Elamite tablets, died in 1980. The Iranian researcher has also translated 2,586 clay Achaemenid tablets into Persian and English which were rendered by Hallock. The work is also handed over to Iran’s Cultural Heritage, Handicrafts and Tourism Organization (ICHHTO) for publication. The three other books of the ‘The Inscriptions of Persepolis’ will be published in Iran gradually. Arfaei, the renowned expert of Elamite, Avestan and Pahlavi languages, is the founder of the Inscriptions Hall of Iran’s National Museum and has written a number of books on Iranian history. He is the only Iranian Elamologist who worked under the supervision of Professor Hallock. Arfaei was the first person who translated the inscription of Cyrus Cylinder. The Iranian expert has also translated more than 2,500 Persepolis inscriptions, which are housed at Chicago University. TEHRAN (FNA)- Vice-president and head of the Cultural Heritage, Tourism and Handicrafts Organization (CHTHO) Mohammad Ali Najafi vowed to follow up the case with returning Iran’s ancient tablets during his upcoming visit to New York. “One of my programs during the visit to New York will be meeting with Chancellor of Chicago University to discuss the return of about 30,000 Achaemenid tablets which are now in New York to Iran …,” Najafi said, saying that his name has been included in the list of the delegation which will be accompanying Iranian President Hassan Rouhani in his upcoming visit to New York. President Rouhani will participate in the 68th annual meeting of the UN General Assembly in New York due to open on 17 September, Iranian Foreign Minister Mohammad Javad Zarif announced earlier. In August, United Nations Secretary-General Ban Ki-moon invited Iranian President Rouhani to participate in the annual meeting of the UN General Assembly in September. The tablets were discovered by the University of Chicago archaeologists in 1933 while they were excavating in Persepolis, the site of a major Oriental Institute excavation. The artifacts bear cuneiform script explaining administrative details of the Achaemenid Empire from about 500 BC. 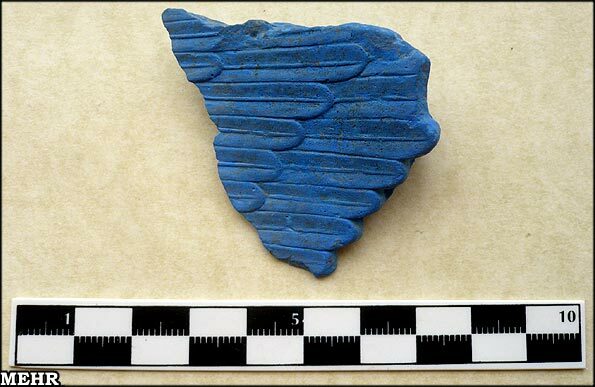 They are among a group of tens of thousands of tablets and tablet fragments that were loaned to the university's Oriental Institute in 1937 for study. A group of 179 complete tablets was returned in 1948, and another group of more than 37,000 tablet fragments was returned in 1951. In spring 2006, US District Court Judge Blanche Manning ruled that a group of people injured by a 1997 bombing in Israel could seize the 300 clay tablets loaned to the University of Chicago's Oriental Institute and the university cannot protect Iran's ownership rights to the artifacts. Following Iranian officials' protests against the ruling, the court was slated to reexamine the case on December 21, 2006, but the court session was postponed to January 19, 2007, allegedly due to the fact that Iran had not provided all the documents required by the court. The court session was held on the above-mentioned date, but no verdict was issued. 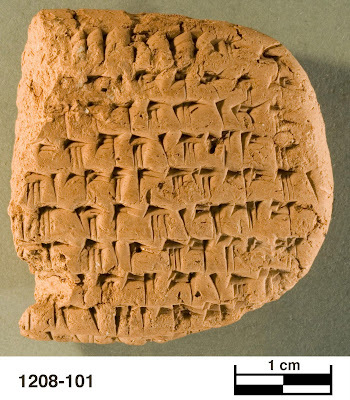 Museum of London has voiced its support for the return of the collection of clay tablets to Iran as the owner of the artifacts. The Oriental Institute holds 8000 to 10,000 intact and about 11,000 fragmented tablets, as estimated by Gil Stein, the director of the university's Oriental Institute. Based on a bill approved by the Iranian parliament in 1930, foreign research institutes were allowed to conduct excavations at Iranian ancient sites exclusively or during joint projects with the Iranian government. Foreigners were also given permission to share the artifacts discovered during the excavation projects with Iranian team members and to transfer their share to their country. 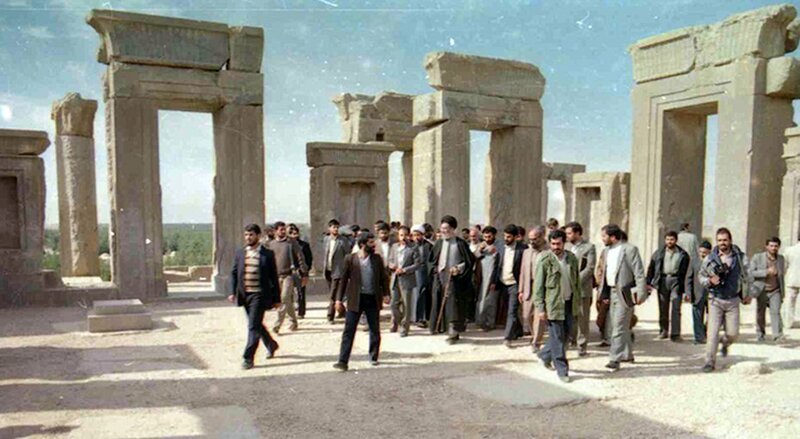 By the act, many Iranian artifacts were looted by foreign institutes working on Iranian ancient sites until the victory of the Islamic Revolution in 1979. The First Circuit Court of Appeals on February 27, 2013 decided in favor of the Museum of Fine Arts, Boston (MFA) and Harvard’s museums in the case of Rubin v. Iran. The case involves victims of a 1997 Iranian-backed terrorist bombing who seek to satisfy a multi-million dollar default court judgment awarded to them in 2003. Since 2005 the Rubin plaintiffs have argued that approximately 2000 reliefs, sculptures, and other archaeological objects located at the MFA and Harvard are the property of Iran that can be seized. The cultural institutions have been contesting that claim, and yesterday the First Circuit agreed. The appeals court decision extended its sympathies to the the plaintiffs, saying “we are mindful of the incident that gave rise to the judgment here and the difficulty the plaintiffs are having collecting on that judgment ….” But the justices upheld “the general rule … that foreign sovereign property in the United States is immune from attachment and execution” because of the Foreign Sovereign Immunity Act (FSIA). 28 U.S.C. § 1609. The U.S. Court of Appeals for the First Circuit ruled Wednesday that people injured by a terrorist attack financed by Iran cannot make a claim on Iranian antiquities held in a Harvard University museum. Several Americans with claims against Iran have tried to collect money owed by that nation by going after antiquities at various American institutions. But the appeals court ruled -- as other courts have ruled -- that there are very limited circumstances in which artifacts can be seized as assets, and that this is not one of them. The legal challenges to ownership of these antiquities have worried many museum officials who have feared that they would be unable to obtain loans of art from other countries if that art might be seized. JENNY RUBIN, ET AL., Plaintiffs, Appellants, v. ISLAMIC REPUBLIC OF IRAN, ET AL.,Defendants, HARVARD UNIVERSITY, ET AL., Trustees, Appellees. APPEAL FROM THE UNITED STATES DISTRICT COURT FOR THE DISTRICT OF MASSACHUSETTS [Hon. George A. O'Toole, U.S. District Judge] Before Howard, Stahl, and Lipez, Circuit Judges. This post is researched, written, and published on the blog Cultural Heritage Lawyer Rick St. Hilaire at culturalheritagelawyer.blogspot.com. The First Circuit Court of Appeals today heard arguments about the meaning of the word "of" in the case of Rubin v. Iran. The Rubin plaintiffs wish to seize "property of Iran" after receiving a multi-million dollar court judgment holding that country responsible for injuries caused by a terrorist attack. The litigants have been unable to obtain payment; therefore, they seek to execute the judgment by taking ancient Iranian cultural artifacts housed at the Boston Museum of Fine Arts (MFA) and the Harvard museums. After losing their case in the lower federal district court, the plaintiffs appealed. Americans attempting to get redress from the Islamic Republic of Iran want to take possession of the artifacts, currently on loan at the Oriental Institute. For nearly 10 years, a lawsuit against the state of Iran has turned the Oriental Institute into a battleground over 2,500-year-old Persian artifacts. This past Saturday, Professor Matthew Stolper, head of the Institute’s Persepolis Fortification Archive Project, gave an update on what he called a “salvage excavation” and revealed the innovative technology that might decide the artifacts’ future. More than just “pieces of dirt that someone poked with sticks a very long time ago,” the archive is “the largest, the most complex, the best dated source of information from within the Persian Empire at its zenith,” Stolper said. The tens of thousands of fragments, pieces of old administrative records excavated from Persepolis ruins in the 1930s, have been a treasure chest for understanding Persian language, religion, daily life and politics. “This loan was an extraordinary thing—an extraordinary act of trust,” Stolper said, since the Institute has been allowed to keep the artifacts on loan from Iran during the pending law suit. “A completely unique discovery is sent off to an American research institute and it is sent intact—it is sent as if they knew it was all one thing. This is almost without precedent in the annals of cultural study,” Stolper said. If the plaintiffs, Americans who lost relatives in 1997 terrorist attacks in Israel, win, the tablets may be sold and dispersed. If they lose, then Iran may demand the artifacts’ immediate return, according to Stolper. The plaintiffs were already awarded redress money that Iran refused to pay, so the plaintiffs are seeking this Iranian property in the U.S. as an alternative form of payment. The Institute has responded with innovative steps to preserve the artifacts, digitally and on the Internet. 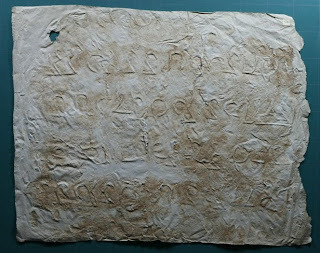 By publicly sharing infrared and photo-edited images of the tablets, alongside intensive linguistic analysis, the Institute is pushing archaeological record-keeping into the 21st century. “Sometimes the images are more useful than the original objects,” Stolper said. Stolper left his audience and future generations, he hopes, with a challenge. “If I can’t convince you it’s something you should be excited about, at least I can convince you it’s something one can be excited about,” he said. The case of Jenny Rubin, et al. v. Islamic Republic of Iran has been restarted in federal district court in Illinois (docket 03-cv-9370). That is because the United States Supreme Court on June 25 declined to hear the Rubin plaintiffs' request to review the Seventh Circuit decision, which ruled against them. Justices Antonin Scalia and Elena Kagan did not participate in the decision. Rubin and the other plaintiffs are trying to recover a court-awarded money judgment against Iran for that nation's sponsorship of a deadly terrorist attack that harmed the parties. They wish to acquire Persian artifacts located at Chicago's Field Museum and the University of Chicago in order execute the judgment. The case moved from the federal district court in northern Illinois to the circuit court of appeals. The case was to be sent back to the district court by the appeals court, but the Rubin plaintiffs sought review by the U.S. Supreme Court. The high court has now returned the case to the district court, where a status hearing is scheduled for July 18 at 3:00 p.m. In a companion case now in the First Circuit Court of Appeals, the same parties seek to acquire Persian artifacts held at the Museum of Fine Arts (MFA) in Boston and at Harvard. The United States filed an amicus brief (i.e. friend of the court brief) on June 7 in support of the MFA, the Harvard museums, and Iran. Federal lawyers argue two points in their brief to the First Circuit. They say that the Terrorism Risk Insurance Act (TRIA) does not authorize the attachment of property not owned by a terrorist state. Second, the government asserts that Iranian property cannot be “contested” within the meaning of the Iranian Assets Control Regulations because "Iran itself has not articulated any claim to the property in question." "The United States emphatically condemns the act of terrorism that grievously injured the plaintiffs, and has deep sympathy for their suffering. The United States remains committed to disrupting terrorist financing and to aggressively pursuing those responsible for committing terrorist acts against U.S. nationals. In addition, however, the United States has a strong interest in ensuring that courts properly interpret TRIA’s scope. Normally, unless a person obtains a license from the Treasury Department’s Office of Foreign Assets Control (OFAC), that person is barred from attaching assets that are blocked under various sanctions programs, such as the Iranian Assets Control Regulations." "The district court found that Iran does not, in fact, own the assets in question. The United States takes no position on the question of ownership. If this Court affirms the district court’s holding, however, that ruling will also preclude attachment of the assets under TRIA. TRIA does not, as plaintiffs contend, permit them to attach the artifacts possessed by the Museums if those assets are not owned by Iran." The government concludes that the court "should hold that the Museums’ artifacts cannot be attached under TRIA unless the plaintiffs establish that Iran owns the artifacts. Additionally, if the Court reaches the issue, it should hold that an asset is not “contested” for purposes of [the Iranian Assets Control Regulations] unless Iran itself is claiming an interest in the asset." Saying that the Seventh Circuit Court of Appeals got it right, the US Solicitor General told the Supreme Court last week to reject the case of Rubin v. Iran. "The order of the district court should be affirmed." That is the simple conclusion written in the Harvard Art Museums' appellate brief filed yesterday in the case of Rubin et al. v. Islamic Republic of Iran v. Museum of Fine Arts and Harvard University et al. The appeal is pending in the U.S. Court of Appeals for the First Circuit. Jenny Rubin and others hurt by a 1997 terrorist attack in Israel filed a 92 page brief yesterday in the First Circuit Court of Appeals. Rubin et al. v. Islamic Republic of Iran v. Museum of Fine Arts and Harvard University et al. is a case where the appellants seek to enforce a judgment awarded to them under the Terrorism Risk Insurance Act of 2002 (TRIA) by acquiring cultural artifacts claimed to be owned by Iran. The objects sought are located in Boston and Cambridge, Massachusetts. Meanwhile, Rubin et al. have also filed an appeal of their Seventh Circuit court case with the U.S. Supreme Court. That case involves an attempt to attach objects located at museums in Chicago. Tens of thousands of clay tablets and fragments from Persepolis are written in cuneiform to express Elamite, an ancient language of western Iran. Tensions between Iran and the United States have rarely run higher, with both governments sparring over alleged terror plots, disputing the nature of Iran’s nuclear program, and vying to influence the uprisings across the Arab world. But in Chicago and Boston courtrooms, the two countries have found rare common ground—neither wants ancient tablets from the royal palace of Persepolis in Iran to end up on the auction block. To the relief of scholars, two recent court rulings may give them their joint wish, preserving open access to what is the most significant source of information on the ancient Persian Empire uncovered to date. In the early 1930s, during excavations of Persepolis, University of Chicago archaeologist Ernst Herzfeld unearthed tens of thousands of fragments of fragile clay tablets dating from about 500 B.C. The fragments were packed into 2,353 cardboard boxes and shipped to the university’s Oriental Institute. The Iranian government of the day allowed the export, with the understanding that the tablets would be translated and then returned. But the task of piecing together and understanding the vast number of fragments has been under way for more than seven decades and the majority of the collection remains in Chicago. Now, fearing loss of the archive, the university has moved into high gear to create thousands of digital images of the tablets, which record the day-to-day accounts of the empire during the reign of Darius the Great (521–486 B.C.) and include records of those traveling on behalf of the king, lists of workers’ rations, and careful notation of offerings made to deities. Researchers hope to have most of this intensive effort completed within the next two years. To get the job done, the institute has assembled what Gil Stein, director of the Oriental Institute, calls a “dream team” of textual scholars, archaeologists, and technical experts in digital cataloguing to take images of the tablets and make them available for public use. Translations are also being done, though it will take much longer to complete that daunting task. “Whether they are seized for sale or the government of Iran demands them back, the tablets will be out of the building soon. We all understand how important and urgent this is,” says Stein. A Massachusetts federal court has ruled that the Museum of Fine Arts and Harvard University will not lose their collection of ancient Persian objects to eight plaintiffs injured in a 1997 terrorist bombing. The United States District Court, District of Massachusetts, issued a five page opinion on September 15, 2011 denying the plaintiffs’ efforts to gain control over the artifacts to satisfy their multi-million dollar court judgment against the government of Iran. Jenny Rubin and several other Americans were injured in Jerusalem after Hamas carried out three bombings. Because the terrorist group received backing from Iran, the eight plaintiffs sued the government of Iran in federal district court in Washington, DC, winning a $71.5 million default award after the Iranian government failed to show up to court. Since then, the plaintiffs have sought to recover that judgment. Even though the Seventh Circuit has ruled, the core issue still is not resolved. That is, the district court will now have to answer the main question – can the antiquities be seized and sold at judicial auction? Read the article in the Summer 2011 Newsletter of the American Bar Association Art & Cultural Heritage Law Committee. Heritage Hunters: Trying to cash in on what Darius and Xerxes left us!? In 2010 James Dolan, chief executive officer of Cablevision got paid about $13 million, or about 400 time the wages of an ordinary you and me. By comparison the manager of the royal household of the Achaemenid king Darius the Great was paid 700 sheep, 600 loads of flour, and 32000 liters of beer and wine. This is about 100 times the wage of an ordinary Achaemenid postal worker (courier). Never mind how much Darius got paid—the king was a national symbol, and therefore beyond labor pricing--but when it comes to income disparity Achaemenids seem to have the U.S. beaten four to one in terms of social justice. How do we know how much workers and top administrators got paid during the Achaemenids? The information comes from deciphering a fraction of the 12000+ clay tablet “file cabinet” found at Persepolis circa 1930, and now stored mostly in the U.S. These are the famous Persepolis tablets now facing death by lawsuit in the U.S. legal system. The U.S. says the IRI is a state sponsor of terrorism and therefore U.S. citizens can sue Iran for injury resulting from IRI sponsored terrorist activity. For example, if Hamas hurts an American citizen during a terrorist attack, the injured person can sue Iran for supporting Hamas’ act. In fact many plaintiffs have already won large damages against Iran; the only problem was how to collect the court awarded money. After some hunting around in law books, they found out that a loophole in the 2002 Terrorism Risk Insurance Act (TRIA) allows them to auction off the Persepolis tablets housed in U.S. universities. That should raise a few million, they thought. The Oriental Institute of the University of Chicago, which is the recipient of two previous PARSA CF grants, has been awarded a $200,000 grant for their important work on capturing, recording, and distributing the information from the famous tablets of the Persepolis Fortification Archive (PFA). The archive is comprised of some 30,000 clay tablets and fragments found in 1933 by the Oriental Institute archeologists, examining and clearing the ruins of Persepolis palaces of kings Darius and Xerxes and their successors, near Shiraz. The tablets contain close to 20,000 original texts in cuneiform and Elamite language, Aramaic script and language, and seal impressions, and are currently on loan from Iran at the Oriental Institute. PFA is the largest and most consequential single source of information on the Achaemenid Persian Empire at its zenith. It provides a very important portal into the languages, art, society, administration, history, geography and religion in the heart of the Persian Empire in the time of Darius I, around 500 BC. It has fundamentally transformed every aspect of modern research on Achaemenid history and culture. The PFA Project at the Oriental Institute is responsible for carefully cleaning these important ancient tablets, taking high resolution digital imagery of the texts on the tablets, exploring various technologies for the best imaging of the tablets such as 3D, laser, and CT scanning), and recording the texts and impressions. An editorial team within the group reviews and prepares editions of the texts, and all of the tablets, texts and impressions are carefully cataloged for publication and archiving. At this point more than 8000 tablets are completed, resulting in almost 40 Terabytes of data, and the team expects to grow the collection to approximately 11,000 over the next two years. The tablets have been subject to a long legal battle where plaintiffs suing the Iranian government are asking for the ancient tablets as compensation. With the fate of the archive hanging in balance, the PFA Project has been under pressure to clean, scan, and record as many tablets as possible and as fast as possible. The grant from PARSA CF helped the PFA Project during an urgent time, since the project was in critical need for servers and other resources. An appellate court ruling a while later at the end of March came out with favorable result for the PFA, although the battle still continues. The PFA project has received support from many other organizations besides PARSA CF, including the Andrew Melon Foundation and the National Endowment for the Humanities. Iran Heritage Foundation is also working closely with the PFA project, and supports and promotes their work. "After almost eighty years, the Persepolis Fortification Archive is producing a growing stream of new information, deeper understanding, and surprising discoveries. Making sure that this stream continues to flow repays the trust and hope that Iran's loan of the Archive to the Oriental Institute entailed, magnifies the cultural heritage of which these tablets are the humble vessels, and lays that heritage before its cultural heirs and before the civilized world" said Matthew W. Stolper, Director, Persepolis Fortification Archive Project. In 1930, archaeologist Ernst Herzfeld came across 30,000 clay tablets on a dig in the ancient city of Persepolis, near modern-day Shiraz. Now these same Persepolis tablets are embroiled in a legal battle involving the Islamic Republic of Iran, the University of Chicago, and a pedestrian mall bombing in Jerusalem. (Reuters) - A U.S. appeals court on Tuesday backed Iran in a dispute with Americans who demand that Persian antiquities in two Chicago museums be used to pay damages for victims of a 1997 suicide bombing in Israel. The decision by the 7th Circuit Court of Appeals overturns a lower court ruling allowing the U.S. plaintiffs to search for any and all Iranian assets in the United States to pay a $71.5 million judgment against Iran. The case grew out of a September 1997 triple suicide bombing at a Jerusalem pedestrian mall that killed five people and injured 200. Two members of the Islamist group Hamas were convicted. The lawsuit filed by five groups of Americans who were either seriously wounded or relatives of the injured argued Iran bore responsibility because it provided training and support to Hamas for attacks. Having won their case, the plaintiffs embarked on a search for Iranian assets to pay the judgment. They found three collections of ancient Persian artifacts -- prehistoric pottery, ornaments, and precious tablets with Elamite writing -- owned by or on loan to Chicago's Field Museum of Natural History and the University of Chicago's Oriental Institute. The museums argued the artifacts qualified for immunity under U.S. law and could not be used to pay the judgment. They said seizing the artifacts would set a dangerous precedent for institutions who rely on scholarly interest to trump political and legal disputes. But the plaintiffs insisted the artifacts were fair game, arguing U.S. legal protections afforded to foreign-owned property do not apply when the property is used for commercial purposes, or when it belongs to an agent linked to a terrorist group. Iran initially ignored demands that it appear in U.S. courts to assert its sovereign rights. It later hired an American lawyer to represent its interests. The appeals court did not rule on the fate of the antiquities but it said the lower court wrongly denied Iran its sovereign immunity, which it says is presumed and did not need to be asserted in court by Iran. The ruling also voided the lower court's order that all Iranian assets in the United States be disclosed, and sent the case back to the lower court for further proceedings "consistent with this opinion." Those victims won a $90-million judgment in 2003 against the government of Iran, which is believed to have financed and trained the terrorists who carried out the Jerusalem bombing. But the victims and their families have struggled to collect any of that judgment from Iran, and their lawyers have sought instead to seize purported Iranian assets in the United States, including antiquities held in American museums. Those legal efforts have been condemned by some scholars as a dangerous politicization of the world's archaeological heritage. In Tuesday's ruling, a three-judge panel of the Seventh Circuit ruled that the lower court had misinterpreted the Foreign Sovereign Immunities Act of 1976, which generally protects the property of foreign governments in the United States. The plaintiffs have asserted that the antiquities in Chicago are exempt from that immunity because of a provision in the 1976 law that excludes property "used for a commercial activity." Matthew Stolper, a professor of Assyriology at the U. of Chicago's Oriental Institute, examines a tablet on loan from the government of Iran. NIAC has received three major grant awards totaling $446,000 from the Parsa Community Foundation, the leading philanthropic organization serving the Iranian-American community. ... A third grant will underwrite a comprehensive media and education campaign about the Persepolis artifacts, priceless Persian antiquities currently caught in a legal battle. The case is ongoing and its outcome could set potentially shattering precedents for the art world, museums and cultural institutions worldwide, as well as have a deep, negative impact on the cultural identity of Americans of Iranian descent. BLOOMINGTON, Ill. – Illinois Wesleyan University will welcome Professor of Assyriology Matthew Stolper on Monday, November 15 at 4 p.m. in Beckman Auditorium of The Ames Library (1 Ames Plaza, Bloomington). His talk, titled “Shattered Window on the Persian Empire: Rescuing the Persepolis Fortification Archive,” is sponsored by the Greek & Roman Studies Department, Eta Sigma Phi and the Classics Club, and is part of the Ides Lecture & Performance Series. The director of the Persepolis Fortification Archive Project at the University of Chicago’s Oriental Institute, Stolper studies clay tablets discovered in the ancient ruins of Persepolis in the 1930s by a University of Chicago expedition. Stolper is hoping to make the tens of thousands of the Persepolis clay tablets, which recorded the daily rule of Achemenid Persian kings from 550-330 B.C., available online. American survivors of terrorist bombings are asking Federal courts to award them possession of the Persepolis Fortification tablets to satisfy punitive judgments against the Islamic Republic of Iran. For additional information about the speaker or the Ides series, contact the Greek and Roman Studies Department at (309) 556-3173. Washington — The fate of clay tablets that recorded details of everyday government transactions in the Persian Empire 2,500 years ago might depend on maneuverings in the government of the modern United States. In 1933 and 1934, archaeologist Ernst Herzfeld excavated an astonishingly large cache of inscribed tablets at Persepolis, once the monumental capital of the Persian Empire, and now a UNESCO World Heritage site. On Sept. 4th, 1997, a Hamas-sponsored suicide attack at the Ben Yehuda mall in Jerusalem took the lives of five people, including three young girls. ...Soon, NIAC will also deploy the Persepolis Center, an online resource that will not only serve as a clearinghouse for background information about the Persepolis Tablets but will also provide a direct connection between NIAC and members with the latest updates on our efforts, new opportunities for members to mobilize, tools for contacting elected representatives, and profiles of endangered collections.If we are successful in our efforts, the Iranian American community can take pride in protecting not only our own cultural artifacts, but all cultural artifacts from the threat of lawsuit in the U.S.
Should Cultural Heritage Be on the Judicial Auction Block? ...Consider the following real life case on which I am currently working. In 1997, several persons, including some Americans, were injured in a suicide bombing in Israel for which Hamas later took credit. In 2003, the U.S. victims of that bombing, in a lawsuit entitled Rubin v. Iran, sued Iran in a U.S. federal court in Washington, D.C. pursuant to a section of the Foreign Sovereign Immunities Act in effect at the time. That portion of the law, 28 U.S.C. §1605(a)(7), permitted Americans who suffered injury (or death) to sue those nations designated by the United States as “state sponsors of terrorism” for providing “material support” to commit an act of terrorism. At the time of the lawsuit, the nations designated as state sponsors of terrorism were Iran, Cuba, Syria, Iraq, Libya, North Korea and Sudan. Today, only Iran, Cuba, Syria and Sudan remain on the list. In the Washington, D.C. case, the Rubin plaintiffs won against Iran a multi-million dollar default judgment, which Iran refused to pay. The plaintiffs, still determined to collect their money, thus registered their judgment in jurisdictions in the United States where the plaintiffs believed Iranian assets were located. They asked the courts in those jurisdictions to permit them to “attach” (a legal term meaning essentially judicial seizure) the various alleged Iranian assets, sell them at judicial auction, and use the proceeds of such sales to satisfy their multi-million dollar judgment. In one such instance, the plaintiffs registered their judgment in the U.S. District Court for the Northern District of Illinois. The plaintiffs selected that court because there are three collections of ancient Persian artifacts owned by Iran or alleged to be owned by Iran in Chicago. One of the collections is not a true collection but rather a smattering of artifacts at the Oriental Institute at the University of Chicago and the Field Museum of Natural History collectively known as the Herzfeld Collection. The artifacts are so named because, according to the plaintiffs, noted archaeologist Ernst Herzfeld surreptitiously took the items from Iran in the early 20th Century and later unlawfully sold the allegedly stolen items to the University of Chicago and the Field Museum. Iran makes no claim to these artifacts and the university and the Field Museum vigorously defend their lawful ownership of the items. The plaintiffs assert that Iran nonetheless owns the Herzfeld items by operation of an Iranian patrimony law which, according to the plaintiffs, provides that any item unearthed in Iran is owned by Iran. Notably, the Rubin plaintiffs also have sued Harvard University and the Museum of Fine Arts of Boston in the U.S. District Court for the District of Massachusetts alleging that those museums also have in their possession several items stolen by Herzfeld and hence are Iran owned. Like the museums in Chicago, however, the Boston museums vigorously defend their lawful ownership of the items. It is also discussed on p. 256 ff. Auctioning Ancient Iranian Artifacts: Implications for US Cultural Policy, By Touraj Daryaee, Associate Director, Center for Persian Studies at the University of California, Irvine, The Huffington Post, December 3, 2009 02:35 PM . ... These tablets only make sense if they are studied as a group and not dispersed throughout the world in the hand of dealers and private collectors. It is a rare archive from antiquity, and so it should remain as such to be studied and understood. It would be a shame to have had in the twenty-first century a unique source for understanding the ancient Persians that got arbitrarily partitioned and dispersed, forcing us to remain in the dark for another 2,500 years about the social and cultural history of these people and the region. As citizens of a society which promotes the understanding and accepting of diversity here and for the world, we must not let this happen. Our people need to be able to go to museums and see these objects to understand the antiquity, beauty, and diversity of the world in which they live in. The auctioning ancient artifacts would be a great mistake. If the current administration allows their sale to private dealers and collectors, the cost, in terms of the destruction of evidence for the study of the history of humanity, as well as with regard to America's reputation, is incalculable. ...At oral argument, the 7th Circuit panel seemed to favor the arguments of the United States, Iran and the institutions, questioning the lower court's authority to disregard the artifacts' apparent statutory immunity. The artifacts "enjoy presumptive immunity" under the Foreign Sovereign Immunities Act, said Judge Diane Sykes. "It can hardly be interpreted otherwise -- that's what it says. Indemniser les victimes d'attentats en vendant de l'art ?, Rue89, Par Marlene Belilos | Journaliste | 24/06/2009 | 15H50. L'Institut oriental de l'Université de Chicago -celle où Obama a été chargé d'enseignement-, dépositaire d'un ensemble d'environ 20 000 tablettes trouvées à Persépolis en 1933, se trouve au centre d'une bataille judiciaire inédite : des victimes d'un attentat réclament la vente de ces objets originaires d'Iran comme indemnisation. Un tribunal de Washington a condamné l'Etat iranien à verser 412 millions de dollars (323 millions d'euros) aux familles des victimes et survivants d'un attentat perpétré à Jérusalem en 1997. The Artifacts of Life, By Carl Marziali, USC News Science / Technology, June 23, 2009 11:16 AM. USC’s first pilgrims to a temple of high-energy physics will be seeking answers to worldly questions about ancient commerce. This is not the first time that USC has brought modern technology to bear on ancient problems. Dodd’s colleague Bruce Zuckerman leads a team that has been creating digital images of the ancient writings on the Persepolis Tablets at the Oriental Institute in Chicago. The project has two goals: to preserve at least digital access to the Iranian government-owned tablets, which may be sold off as part of a lawsuit seeking to punish Iran for its ties to the terrorist group Hamas; and to reduce physical study of the tablets by scholars. “Looking at a text is probably the most damaging thing you can do to it,” Zuckerman said. The Big Apple Raises $110,000 to Protect the Persepolis Tablets, NIAC, Thursday, 11 June 2009. Special guest, Professor Matthew Stolper who has dedicated his career to studying these tablets, made the gravity of losing just one of these artifacts crystal clear - If there are too many of these tablets being auctioned, their value will drop. So what do people do to ensure that the price remains high? "They destroy a good number of them," he exclaimed to a shocked audience. 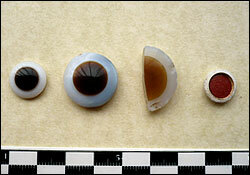 He also stressed the importance of keeping these items together, in fact, they are really to be seen as one item. Like a dinosaur fossil - if one bone is missing, we lose a sense of what the animal was. The same goes for these artifacts which tell the story of the Persian empire during the time of Darius the Great. Victims of terrorist attack in Israel can proceed with claim for US antiquities, The Art Newspaper. From issue 191, May 2008. Published online 1.5.08. A federal court in Massachusetts affirmed on 31 March that Iranian antiquities at the Museum of Fine Arts Boston and the Harvard University Art Museums might be subject to a claim by the victims of a terrorist bombing allegedly sponsored by Iran...In the latest round of litigation in Massachusetts, the court declined to reconsider its prior ruling that the plaintiffs might be able to claim the antiquities under the Terrorism Risk Insurance Act of 2002. The case will now go to the federal appeals court. Farhang Foundation fundraising in support of the Persepolis Tablet Project of Professor Matthew Stolper at the University of Chicago, Farhang Foundation Blog. Posted by Bita Milanian on May 28, 2009 at 2:02pm. Iranian American Bar Association Panel June 10th to Discuss Persian Antiquities in Peril, © Business Wire 2009, 2009-06-04 19:38:02 - . 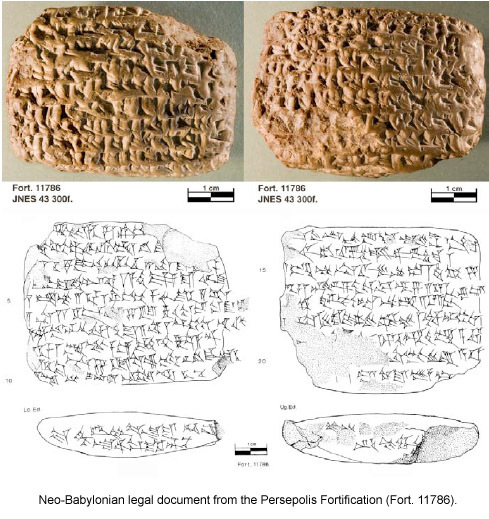 Supreme Court Case can Decide Fate of Persepolis Tablets , Written by Ehsan Tabesh, National Iranian American Council (NIAC), Friday, 29 May 2009. Washington DC - As the U.S. District Court decides the fate of thousands of historic Persian artifacts, the U.S. Supreme Court will soon determine whether U.S. citizens can sue the newly formed Republic of Iraq for the misdeeds of the former Saddam Hussein regime. The timing of the case is critical to not only future claims filed against sovereign nations including the United States, but also the outcome of two suits that seek to seize and auction off invaluable artifacts from Persepolis with great historical significance to Iranian Americans. Iran's treasures aren't safe, by Kriston Capps, UTV Media, Wednesday, 13 May 2009. The Tehran Times reports that Iran's ministry of culture and Islamic guidance rejected a request from the US National Gallery of Art to borrow a painting by Gauguin from the Tehran Museum of Contemporary Art. Speaking to the ministry's decision, office for visual arts director Mahmud Shaluii had heated words: "In response to the National Gallery of Art director, we said that the United States is not legally safe for Iranian artworks." Iran rejects U.S. National Gallery of Art’s request for Gauguin painting, Tehran Times Art Desk, Wednesday, April 22, 2009. The Tehran Museum of Contemporary Art (TMCA) recently turned down a request from the National Gallery of Art in Washington for a loan of a Paul Gauguin still life for an exhibition ... it is not possible to loan the painting due to the lack of confidence that the United States will safeguard Iranian artworks,” noted Shaluii, who is also the curator of TMCA. 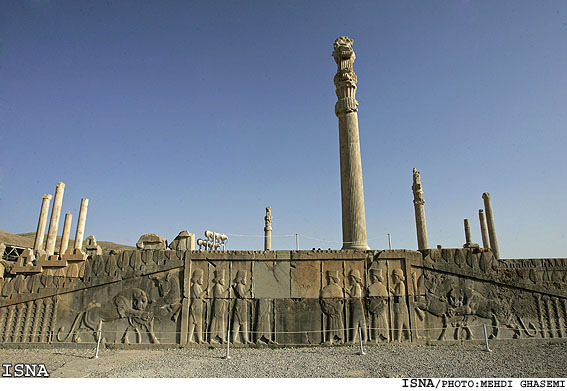 Iranian Americans Raise $50,000 to Preserve Persepolis Artifacts, Written by NIAC, Wednesday, 25 March 2009. NIAC's special guest was Professor Matthew Stolper of Chicago University, the caretaker of the prized Persian artifacts in the Persepolis Fortification Archive Project. He spoke extensively on the vast significance of the Persepolis artifacts to ancient Persian history and to the international community. Appeal for Protection of Persian Artifacts Reaches New Heights, Written by NIAC, Thursday, 12 March 2009. Washington, DC - Today, the National Iranian American Council (NIAC) -- the largest Iranian-American grassroots organization -- presented a brief Amicus Curiae to the U.S. District Court for the Northern District Illinois Eastern Division in a lawsuit that seeks to seize and auction off thousands of historic Persian artifacts of substantial historical importance currently on display at the University of Chicago. "NIAC believes these artifacts qualify as cultural property and are part of the cultural heritage of all persons of Iranian descent," said Trita Parsi, President of NIAC. "Our role is to ensure that they are not confiscated and auctioned off to the highest bidder - an act that would not only contradict the principles embodied in numerous laws and treaties, but set a terrible precedent in America and for several similar cases as well as potentially result in retaliation against U.S. properties worldwide." In presenting its brief, NIAC seeks to act as an amicus curiae or "friend of the Court," and will ask the Court to consider the cultural importance of these artifacts when interpreting the provisions of law that will govern its ruling. Since 2004, the Oriental Institute has found itself at the unlikely nexus of archaeology, law, and terrorism. At stake are millions of dollars, a collection of 2,500-year-old tablets, and possibly the future of archaeological research. With its stone fireplace and wood paneling, it would be less surprising to see Indiana Jones walk into Gil Stein’s office at the Oriental Institute than the visitor who stopped by five years ago. “Are you Gil Stein?” the man asked, standing in the doorway to Stein’s office. Stein answered in the affirmative. “You’ve been served,” the man said, handing over an envelope. And with that, he turned and left. 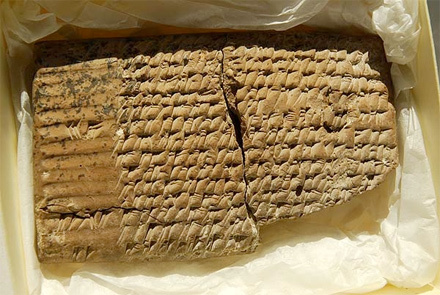 The envelope revealed a summons from the federal district court of the Northern District of Illinois, demanding that Stein, the Institute’s director, turn over ancient tablets from the Institute’s Persepolis Fortification Archive and Choga Mish collection. They would be sold, according to the summons, in order to compensate victims of a 1997 terrorist attack funded by Iran. Obama and the Persian Treasures in Chicago, by Trita Parsi, Posted March 4, 2009 | 02:25 AM (EST), The Huffington Post. ...Under the law, President Obama has the power to issue an executive waiver to stop the seizure of foreign assets if that would further US national security. Considering the importance of the President's efforts to reduce tensions with Iran and solicit its collaboration in Iraq and Afghanistan, and the dire consequences of failure, President Obama should do exactly that. It's not the easiest decision politically, but no one ever said overcoming 30 years of enmity would be easy. Persepolis Fortification Archive at center of lawsuits, by Will Anderson, March 2, 2009. News from the Division of the Humanities, Posted on February 27th, 2009. The victims of two different terrorist attacks have filed two separate lawsuits, both of them competing for the right to auction the Persepolis Fortification Archive. Chicago Magazine and the San Francisco Chronicle are two of several news sources that have picked up the story: the Persepolis Fortification Archive, on loan from Iran and under the care of the Oriental Institute since the 1930s, might be seized to help pay for damages awarded to over 800 victims of terrorist attacks. The archive consists of thousands of inscribed clay tablets, all of them 2500 years old, that taken together are scholars’ best aid in understanding the everyday workings of the Persian empire. Iran: on the Persepolis Tablets Case (A. J. Cave, US; ex-Iran) , World Association of International Studies | PAX, LUX, et VERITAS, Posted on February 27th, 2009. My friends tease me that I wrote some 700+ pages of romance just to put the Persepolis Fortification Archive in the context of time and place and show the horror that the Persians must have felt at the time watching Persepolis [Parsa] burn by the hands of the bloody invading Macedonians. A grief that still burns the tips of my fingers. The third chapter of my book: “Axis of Empire” passing through the ruins of Persepolis is available in PDF format, and here is a link. CHICAGO — The professor opens a cardboard box and gingerly picks up a few hunks of dried clay — dust-baked relics that offer a glimpse into the long-lost world of the Persian empire that spanned a continent 2,500 years ago. Matt Stolper has spent decades studying these palm-sized bits of ancient history. Tens of thousands of them. They’re like a jigsaw puzzle. A single piece offers a tantalizing clue. Together, the big picture is scholarly bliss: a window into Persepolis, the capital of the Persian empire looted and burned by Alexander the Great. The collection — on loan for decades to the University of Chicago’s Oriental Institute — is known as the Persepolis Fortification Archive. These are, to put it simply, bureaucratic records. But in their own way, they tell a story of rank and privilege, of deserters and generals, of life in what was once the largest empire on earth. For Stolper — temporary caretaker of the tablets — these are priceless treasures. US urged to return Persepolis tablets, by PRESSTV, Mon, 02 Feb 2009 17:28:37 GMT. International archeologists have asked US President Barack Obama to help return the Elamite tablets of Persepolis to their home in Iran. Paying with the Past, by Gwenda Blair, Chicago Magazine, December 2008. In March 1933, an archaeological expedition from the Oriental Institute, a division of the University of Chicago, was working in southwestern Iran among the ruins of Persepolis, the onetime capital of the ancient Persian Empire. 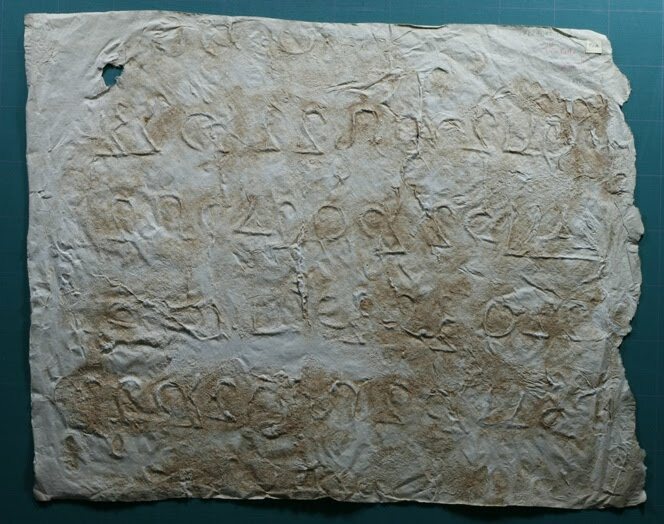 While building a road for trucks to bring in drinking water, laborers accidentally uncovered a huge archive of 2,500-year-old clay tablets, inscribed with wedge-shaped cuneiform characters, that had been stored inside a fortification wall. Five decades later, in October 1983, a terrorist drove a Mercedes truck loaded with explosives into the U.S. marine barracks in Beirut and killed 241 American servicemen. Fourteen years after that, in September 1997, terrorists set off suitcase bombs at Ben Yehuda, a popular pedestrian shopping mall in Jerusalem, killing five people and wounding nearly 200. Claiming that Iran underwrote both bombings, the U.S. survivors and family members of those who were killed sued that country in separate federal lawsuits in Washington, D.C., in 2001. Iran did not make an appearance, and the plaintiffs won a total of more than $3 billion in default judgments. The tablets, basically an administrative record, chronicle the distribution of food within Persepolis and the surrounding region. Now these disparate elements are coming together in a Chicago courtroom. The plaintiffs in the bombing cases say that the only way they can collect what is owed to them is to force the sale of the Persepolis tablets, currently at the University of Chicago on loan from Iran, and they have filed lawsuits demanding that the archive go on the auction block. Iran wants US to repatriate inscriptions, antiquities, Posted: 2008/12/16, Mathaba News Network. Foreign Ministry spokesman Hassan Qashqavi on Monday appealed to US institutions to repatriate Iranian inscriptions saying that their refusal has led to severance of Iran-US archaeological relations. On Art! Beyond Babylon...to federal court, In this installment of IntLawGrrls "On Art!" series on artifacts of transnational culture, guest blogger Judith Weingarten, an archaeologist, returns to the blog with an account of legal issues swirling about a new show at a leading U.S. art museum, 25 November 2008. The latest archaeological blockbuster at New York's Metropolitan Museum of Art is Beyond Babylon: Art, Trade and Diplomacy in the Second Millennium B.C. The exhibit, which opened a week ago today, runs through March 15, 2009, and is reviewed here by The New York Times, is the direct sequel to the Met's 2003 Art of the First Cities, which covered the third millennium B.C. But unlike the 2003 show, which took place as American troops invaded the heartland of ancient Mesopotamia, there is a gaping hole in the new show: 55 pieces from Syria — stone sculptures; frescoes; goldwork, including this stupendous bowl from the ancient city of Ugarit (left) – were not sent as promised to New York. In a wall card near the beginning of the show, the Met thanks the Syrian government for its willingness to lend such important objects, and expresses "deep regret that recent legislation in the United States has made it too difficult and risky for the planned loans to proceed." That legislation, an amendment made in January to the Foreign Sovereign Immunities Act, permits private individuals claiming to be victims of state-sponsored terrorism to file liens against property belonging to that state whenever the property is in the United States. Property loaned to museums may fall within the ambit of this amendment. Persian Artifacts Case: An Insider’s Perspective, By Babback Sabahi in The Iranian American Bar Association ("IABA") Review, volume 3, Fall 2008. Persepolis skatter i rättslig tvist, By Ashk Dahlén in Svenska Dagbladet, 1 september 2008. ["...On Monday, Iran's representative wrote to the tribunal's clerks asking for various documents filed in connection with the American-Iranian dispute. "The documents are to be produced to the plaintiffs in a litigation pending before a domestic court," M.H. Zahedin-Labbaf wrote, a court filing in Chicago shows. Legal Dance on Persepolis Artifacts Continues, By Arash Hadjialiloo, NIAC, 06/23/08, Payvand. NIAC: Struggle over Persian artifacts continues, June 19, 2008, IRANCOVERAGE. 'They can give us justice': Families of Marines killed in Lebanon join suit seeking Iran funds, May 30, 2008, By Dave Newbart, Sun-Times News Group. US terrorism claimants compete for Iranian assets, By Andrew Stern. Reuters Thu May 29, 2008 6:27pm EDT. Judge Gives Terror Victims a Victory Over Iran: Rules in Case Involving Artifacts Held by Chicago Museums, By JOSH GERSTEIN, Staff Reporter of the New York Sun, May 28, 2008. Achaemenid inscription names uncle of Darius in Old Persian for first tim, Tehran Times. Heritage on a store shelf: U.S. federal court threatens Iranian-American heritage, by Arash Hadjialiloo , 16-Mar-2008, Iranian.com. NIAC enlists major law firm to protect Persian Tablets, by Shadee Malaklou, Mar 12, 2008, National Iranian American Council (NIAC) Newsletter. Federal Court Threatens Iranian-American Heritage, by Arash Hadjialiloo , Mar 12, 2008, National Iranian American Council (NIAC) Newsletter. Rubin v. Islamic Republic of Iran: latest reported opinion. Higher Ed Law Prof Blog: A Member of the Law Professor Blogs Network. اقتباس يا ابتكار، ميراثی از كورش يا داريوش خط ميخی فارسی باستان. آخرين به روز رسانی, ۱۳۸۶/۱۱/۲۹ - ۱۱:۵۱. Iran's Arfaei finds new Elamite words. Press TV, Sun, 27 Jan 2008 22:25:23. Open Access Publications on Ancient Iran from the Oriental Institute. Persepolis Fortification Archive Web Presence at the Oriental Institute. Persepolis Fortification Archive Project Blog by Persepolis Fortification Archive Project is licensed under a Creative Commons Attribution-NonCommercial-ShareAlike 3.0 Unported License.